By Anthony Crupi . Published on January 02, 2018. While seemingly everyone from the Papa John's guy to the President of the United States has seen fit to weigh in on the NFL's season-long TV ratings slide, pro football's Kung Fu Grip on American viewing habits remains indisputable. Despite losing 9 percent of its year-ago audience and coming under attack from both sides of the political spectrum, the NFL in 2017 continued to cast a long shadow over the media landscape. According to Nielsen live-plus-same-day data, NFL games accounted for 37 of the year's top 50 broadcasts, or nearly three-quarters (74 percent) of the most-watched programs on TV. That marked a 32 percent increase compared to 2016, when the NFL laid claim to 28 of the top 50 most-watched programs, and was flat versus the 37 top airings the league chalked up in the previous year. All told, the NFL put its stamp on 13 of this year's top 20 broadcasts, and while most of those slots were commandeered by postseason games, two of the biggest draws were regular-season matchups. With an average delivery of 26.9 million viewers and a 15.2 household rating, CBS's coverage of the Dec. 17 Patriots-Steelers nail-biter now stands as the 15th most-watched, highest-rated program of 2017, while Fox's presentation of the Sept. 17 Cowboys-Broncos blowout (Denver demolished Dallas by a 42-17 margin) ranks 19th with 26 million viewers and a 14.3 rating. It is perhaps worth noting that neither of those big-reach broadcasts aired in prime-time. As has been the case for the better part of the last decade, the NFL's national Sunday afternoon window is by far the most valuable chunk of real estate for advertisers with deep pockets. Per Nielsen, CBS and Fox together averaged 22.2 million viewers and a 12.3 household rating in the 4:20 p.m. ET window, which marked a 9 percent decline when compared to last season's 24.5 million viewers and 13.5 rating. Discounting playoff games and the Super Bowl, the late-national package scarfed up 16 of the year's top 50 broadcast slots. According to media buyers surveyed before the season kicked off, the going rate for a 30-second sliver of ad inventory in the blockbuster window was north of $715,000 per unit. NBC's "Sunday Night Football," which remained the No. 2 NFL window with an average delivery of 18.2 million viewers and a 10.3 household rating, accounted for six of 2017's top 50 broadcasts. And while that marked an 11 percent drop from the year-ago 20.4 million viewers and 11.4 rating, the margin separating "Sunday Night Football" from its general-entertainment competition is only widening. In eight head-to-head fall matchups, NBC's premiere NFL showcase averaged a 6.5 rating in the target demo, which works out to 8.38 million adults 18-49; by comparison, AMC's "The Walking Dead" drew a 3.8, or around 4.9 million members of the dollar demo. Speaking of scripted series fare, dramas and sitcoms once again failed to crack this year's top 50 list. As viewers continue to wean themselves from the networks' timetables in favor of time-shifted consumption, massive live TV deliveries effectively are limited to sports and special annual events like the Academy Awards. (Per Nielsen, 93 percent of all sports TV viewing last year was done live, whereas only about 70 percent of general-entertainment primetime consumption occurred in real-time.) As consumers who watch TV in real-time tend to stick around for a disproportionate amount of commercial messaging, advertisers would be wise to spend their marketing dollars accordingly. This year's most-watched scripted program aired back on the very first day of the 2017-18 broadcast campaign. The Season 11 premiere of CBS's "The Big Bang Theory" on Sept. 25 scared up 17.7 million live-plus-same-day viewers and a 10.5 HH rating, good for 58th place. That opening episode edged out Fox's broadcast of "24: Legacy," which on Feb. 5 delivered 17.6 million viewers, making it the lowest-rated Super Bowl lead-out in 14 years. 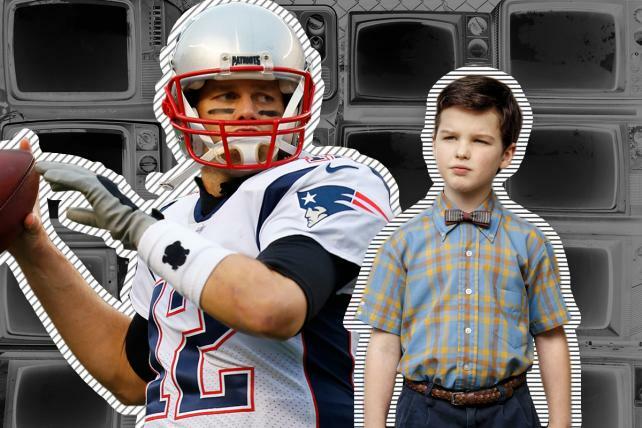 Of the 20 new scripted series that have debuted since the start of the current broadcast season, only CBS' comedy "Young Sheldon" has come anywhere near to cracking the upper echelon. Bowing in the plum post-"Big Bang" slot, the Sept. 25 preview of "Young Sheldon" averaged 17.2 million viewers and a 10.0 household rating, making it the year's No. 63 program. When the year's biggest broadcasts are broken down on a network by network basis, Fox had bragging rights to the most events in the top 50, with 15 NFL broadcasts (including Super Bowl LI and four NFC playoff games) and two World Series games giving it the edge over rivals CBS (13) and NBC (13). ABC, which does not enjoy the luxury of hosting a regular slate of NFL contests, popped up five times thanks to three NBA Finals broadcasts, its simulcast of the Dec. 7 AFC Wild Card showdown that originated on ESPN and the Academy Awards. Season-to-date, broadcast prime-time ratings are down 9 percent compared to the year-ago period, with the Big Four nets averaging 6.3 million viewers per night, down from 6.95 million in the first fourteen weeks of the 2016-17 schedule. The NFL's own 9 percent decline is of a piece with the slump in overall TV viewership, although football's scale dwarfs everything else on the tube. Through Week 16 of the NFL season, all regional and national broadcast windows are averaging 14.9 million viewers, which represents a loss of some 1.4 million viewers compared to 2016. NFL household ratings are down 8 percent to an 8.6 rating. While NFL ratings took another hit this season, demand for ad time remains heavy. According to Standard Media Index estimates, overall in-game NFL ad sales revenues are up 2 percent year-over-year, while makegoods (aka audience deficiency units) are down slightly. In 2016, 22 percent of all in-game NFL spots were salted away for ADUs, while 21 percent have been thus allocated this season. Also seeing a slight increase is the average unit cost of an in-game spot. Per SMI, a 30-second commercial in this season's NFL slate fetched some $473,775 a pop, up 1 percent compared to $468,434 in 2016.